Russian journalists, filmmakers and actors wrote an appeal to Russian President Vladimir Putin asking him to pardon Ukrainian political prisoner Oleg Sentsov. The appeal was signed by journalists Vladimir Pozner and Ksenia Sobchak, the Head of Federal Agency on Culture and Cinematography Roskino Ekaterina Mtsituridze, the filmmakers Konstantin Bronzit, Andrei Zvyagintsev, Pavel Lungin, Yuri Norshtein, Aleksandr Sokurov, Valery Todorovsky, Aleksei Uchitel, Aleksei Fedorchenko, and actress Chulpan Khamatova. “It is necessary to show mercy in order to save human life. We need to soften the political climate in the country, to put up with neighbors. 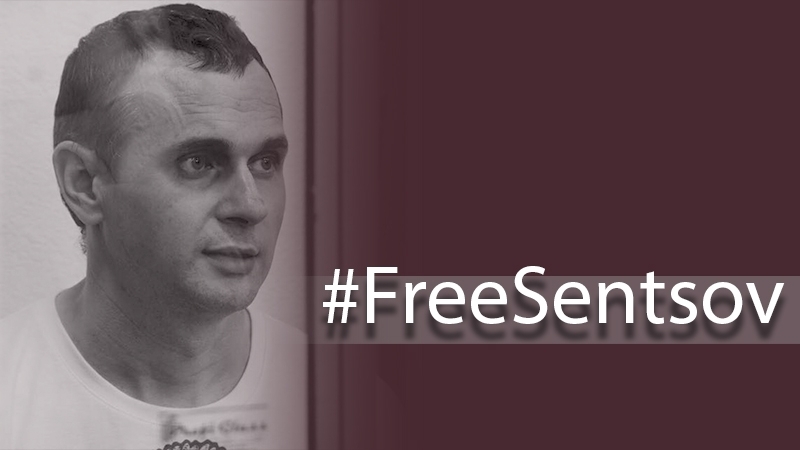 Have mercy on Oleg Sentsov, we ask you,” the appeal said. They noted that Sentsov's guilt was not that grave to sentence him to 20 years of imprisonment. Earlier, the Ukrainian Ombudsman Lyudmila Denisova said that she was denied a meeting with Oleg Sentsov. According to Denisova, the head of the department refused to provide any information about the prisoner's state. QHA reported that Oleg Sentsov started the hunger strike on May 14, demanding the Russian authorities to release all Ukrainian political prisoners.